You are here: Home / Sermons / Was Constantine the Great Baptized An Arian? A common myth circulated by critics of Constantine the Great to discredit his character and the good he did for the Church is the accusation that he was baptized into the Arian heresy by Eusebius of Nicomedia, who was an Arian, in May of 337, a few days prior to his death. “They have even gone to the point of erasing his orthodoxy because he was baptized by Eusebius of Nicomedia” (History of the Greek Nation, vol. 2; p. 150). The whole misconception about Constantine the Great being baptized an Arian originated from an incident of the First Ecumenical Council, during which Eusebius of Nicomedia was presented as a leader of the Arians. This is the only connection critics have associating Constantine with being an Arian, having accepted baptism from a supposed heretic. However, critics have not taken into account the entire historical data available to establish the truth of the matter, relying instead on speculation and conspiracy theories that are unfounded to push their own agenda. Without taking into account the fact that the Church faced these issues, they inevitably lead to the wrong conclusions. Because according to Ecclesiastical Tradition, which is crystallized in its Canon Law, one is not considered a heretic if he professes falsehood until he is invited to revoke and renounce his cacodoxy (false teaching). 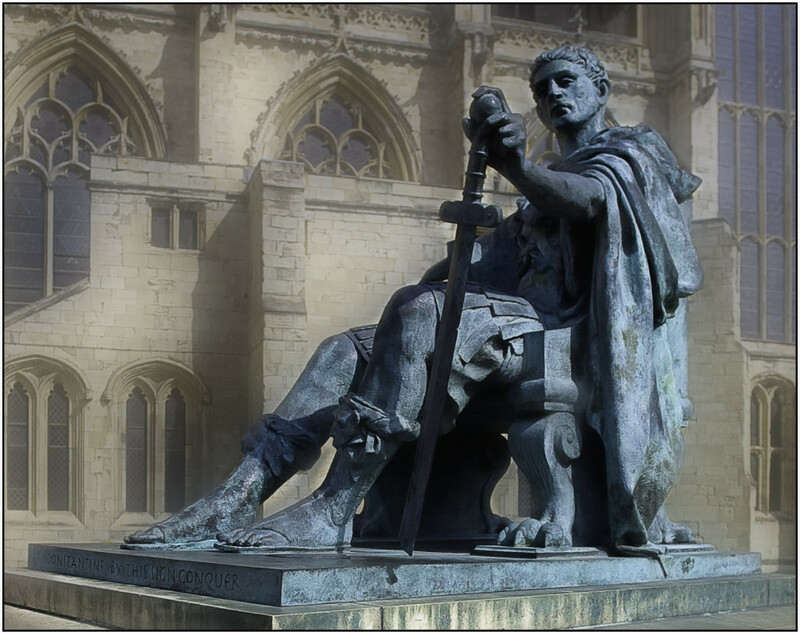 The fact that one cannot be considered a heretic until one is invited to revoke and renounce his cacodoxy is a key element in arriving towards the truth of this issue regarding Constantine the Great. Furthermore, it must be emphasized that the characterization of a man as a heretic cannot be determined by one person or by a set of opinions, but must be determined by competent ecclesiastical organs, since it is not possible for every Christian to determine by himself who should be determined a christian and who should be determined a heretic. “All the Fathers of the Synod accepted unanimously the Holy Creed, including those who professed Arianism, other than the above two, after around the six day dogmatic deliberations, and they signed on the 19th of June in the year 325” (The Dogmatic and Symbolic Writings of the Orthodox Catholic Church, vol. 1; p. 118). This letter given to us through Sozomen is significant, because it states that Eusebius of Nicomedia accepted the Orthodox Faith and sought communion with the Catholic Church and renounced the heresy of Arius. It also reveals why Eusebius was sent into exile originally – because he refused to excommunicate Arius. Certainly in the years following the First Ecumenical Council in 325 Arian disputes continued to arise and gained resurgence, and Constantine did sometimes show favor to Arian bishops, but he did this sparingly in order to keep the peace of the Empire and the unity of the Church. For Constantine, as long as you showed loyalty to the undivided Church, he did not over-question personal intentions and thus disturb the peace. And if anyone did disturb the peace, be they Orthodox or not, they were sent into exile, as was the case with St. Athanasius of Alexandria. But as far as Constantine knew, Eusebius repented of his error in his letter and he was restored to his See and gained the favor of Constantine precisely because he was Orthodox. And it was from this canonical bishop of the Orthodox Church, Eusebius of Nicomedia, that Constantine received Holy Baptism, fully in canonical communion with the Church. Consequently, there is no hesitation on the part of the Orthodox Church, which takes the entire historical data into account, that Constantine the Great was baptized as an Orthodox Christian by an Orthodox bishop. Share the post "Was Constantine the Great Baptized An Arian?"